Cant defeated a deep Dutch team. Van der Poel got the better of a stacked Belgian squad. We debate and analyze the action. Denmark delivered a weekend of exciting cyclocross racing in Bogense at the UCI World Cyclocross Championships. The elite women’s race was a story of redemption, with Belgian Sanne Cant winning her third consecutive rainbow jersey at the end of a lackluster season. Mathieu van der Poel’s (Netherlands) win on Sunday was all about revenge. He finally vanquished his Belgian rival Wout van Aert after losing worlds two years in a row. There was plenty of drama on the oceanside track this weekend, so let’s roundtable! Okay, let’s get this out of the way first: What happened in the fateful pit exchange that caused Lucinda Brand to crash? And did it cost her the race? Fred Dreier, @freddreier: What happened in the pit? Cyclocross happened in the pit! 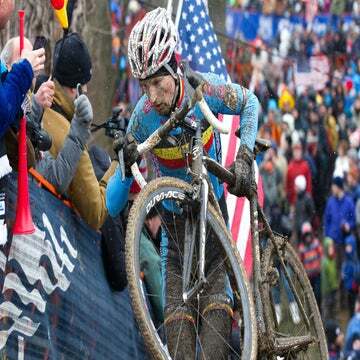 The best thing about cyclocross is that a rider’s overall skill is placed on equal footing with legs and lungs. Brand was likely tired from putting in the chase of her life, and when you’re tired, mistakes happen. That’s cyclocross. I do not believe the pit crash cost her the race, as Sanne Cant was simply more skilled on the various technical areas of the course. Perhaps Cant and Brand were on equal levels of legs and lungs, however Brand’s numerous crashes — not just the pit crash — was a sign that the best rider did, in fact, win. Spencer Powlison, @spino_powerlegs: The announcers on NBC Sports Gold were quick to blame the mechanic, but it looked to me like Brand got her timing wrong. She didn’t unclip and let go of the handlebars early enough, and you can see that in how she rolled on her left side. It’s a bummer because based on how strong she was on the course’s extended pavement sections, I think she had a chance against Cant. Chris Case, @chrisjustincase: Well, according to Lucinda, her dad (who was the one to take her bike) was at fault for grabbing the bike a bit too early while her foot was still clipped in. She did say she would forgive him, though, or else they couldn’t have Christmas dinner together. However, from the footage I saw, it looked to me like both rider and pit crew were partially at fault. Maybe dad grabbed the bike a bit too early; it seems clear Lucinda held on longer than she should have, and the twisting of the bike’s handlebars drove her into the ground. In either case, I don’t think it cost her the race. If anything, an incident like that will sometimes make a rider go even deeper, out of rage. Sure, she lost some time, but Sanne Cant rode a superior race and, more importantly, a clean race. The Dutchwomen had the numbers advantage, so what could they have done differently to win? Fred: Early in the race Denise Betsema and Annemarie Worst put in several big efforts on the front, which widened the gap to Brand who was chasing. Brand had to put in an enormous effort to make the front group. In other moments, Betsema seemed to pull extra hard, which dropped Marianne Vos. While I would have liked to have seen the Dutch employ road racing tactics, and attacked one-by-one, forcing Cant to chase, I’m not sure if the course was friendly to such dynamics. Plus, Cant’s smooth riding kept her near the front. But, had the Dutch forced Cant to set the pace early, they could have allowed Brand and Vos to save valuable matches. Next year, ladies. Spencer: I don’t think they should have let Cant control the pace for the majority of the race. Move Vos or Brand to the front and force Cant to make the move. It also gives the Dutch a back-up if one of the riders slips out or makes an error. If the front rider bobbles, they’ll lose one position at most. If one of the Dutchwomen in third or fourth slips up, no problem, because her teammate is in the lead. Chris: I never got the sense they were riding as a team; if they had, they could have employed a number of strategies: They could have taken turns attacking — one rider would strongly attack, the teammates would sit up and block — or they could have protected a designated leader. Instead, it seemed like their efforts were uncoordinated. Granted, it can be difficult to employ strategies amid the chaos of a race like that, and communication can break down when you’re approaching your redline. In the men’s race, the Belgians were second and third. What could they have done to challenge eventual winner Mathieu van der Poel? Fred: Mathieu van der Poel was the strongest and the most technically adept rider. He deserved to win, and there was nothing the Belgian men could have done. The race’s slippery off-camber forced all of the front riders to dismount and run — Wout van Aert even slipped out and nearly crashed — yet van der Poel rode it and made it look easy. Spencer: I think the Belgians should have found a way to protect Toon Aerts a little better through the middle of the race. He had to make a couple of big efforts on the road to bridge back up. Yes, van Aert is the reigning champion, but based on how many matches Aerts burned — and still managed to make the podium — I feel he was the best rider on the day to challenge van der Poel. Chris: Honestly, nothing. Mathieu is far and away the best ‘cross rider on the planet, physically, mentally, and technically. (He had one bad race this year at Koppenbergcross, one DNF early in the season, and he won the other 27 races he started.) Wout and Toon made several mistakes throughout the race that allowed Mathieu to get a gap. Had they not made those mistakes, MvdP still would have crushed them. They could have attacked him out of every corner. He still would have crushed them. And to those who say that is boring, I feel sorry for you. If you can’t appreciate watching, and learning, from one of the great cyclists of our time, then I’m not sure how you call yourself a fan of cyclocross. Toon Aerts made a remarkable comeback in the final laps of the race only to crash out of the silver-medal position. Describe your emotions as you watched those final moments of the race. Fred: I was disappointed, since Aerts made huge strides this year and really forced himself into the years-old Wout vs. MvdP conversation. Silver lining. Toon is about the same age as Wout and MVDP, and with those two likely to focus on other ambitions in the coming years, Toon could very well become cyclocross’s next big thing. Spencer: Aerts? Van Aert? I can’t say I’m a super-fan of one or the other. But when I saw Aerts looming in van Aert’s rearview, I couldn’t help but get that old feeling of excitement. It was that anticipation you felt when watching Sven Nys hunt down Niels Albert back in the day. After van der Poel flew the coop, we needed this exciting climax. Aerts made his move, and it seemed a done deal, but the crash had me out of my chair and nearly spilling the coffee. Hate to see him lose like that, but it was a thrilling battle for second. Chris: I was excited to see Toon claw his way back; I figured Wout was saving a little something to try and hang with Toon once he bridged the gap. So it seemed like it would make for a great final-lap duel. And it did. But then when Toon went down in one of the final corners, I was just bummed for him. That stings. I never want to see someone lose a position, and in this case a silver medal, because of something silly like that. Then again, he made several mistakes throughout the race, so you can commend Wout for riding cleaner, sticking with it, and taking advantage of his rival’s mistake.